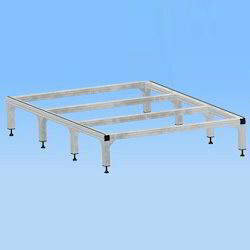 We are a leading Manufacturer of aluminium modular machine base from Coimbatore, India. Owing to our prominent experience of this domain, we are engaged in offering high quality Aluminium Modular Machine Base. Offered range is manufactured by making use of good quality components and innovative techniques under the strict vigilance of our team of adroit professionals. In conformity with set quality standards, the provided product is well known for its high operational fluency. Tested before delivering at clients end, this product can be availed by our clients at reasonable prices.